Audra Geras, an emerging fine artist, will have 20 of her abstract digital paintings included in a group show at the Soho Arthouse in New York. The gallery’s spring show, entitled SPRUNG, will have its opening on March 3rd from 6 to 9 PM. The gallery is located at 138 Sullivan Street, NY, NY. The response to Audra’s evocative and lyrical paintings has been very enthusiastic and Audra is excited to be participating in the group exhibit. Audra’s fine art paintings are available in the form of limited edition museum quality giclée prints. The two paintings shown here were created in 2014 and will be included in the show. 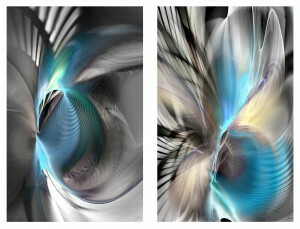 They form a diptych entitled ‘Chrysalis’ and ‘Emergence’, each 22″ by 35″.